The New York Times’s Binyamin Applebaum posted a piece this weekend on just how the Fed would raise interest rates, should it make the decision to do so. There have been a handful of such “explainers” in recent months, but Big Media has mostly avoided the subject of just how the Fed would “raise rates” when $2.6 billion in excess cash resides in the banking system. If there’s a reason why borrowing money is virtually free, that’s it. Common sense, not to mention the Law of Supply, would suggest that when there’s too much of a good, the supplier of the good loses the ability to increase its price in the absence of a massive increase in demand for the good. That simple matter seems to have eluded the Fed’s corps of access journalists, who dutifully repeat the Fed’s company line, with a few mild platitudes thrown in to represent “opposing viewpoints.” I have gone on record in the past pointing out the flaws in the view that the Fed can control rates by paying banks an increased subsidy to influence them to raise the rates they charge their customers. In that vein, here is my take on the New York Times piece, with quotes from the Times followed by my observations. It’s easy to take for granted the Federal Reserve’s ability to raise interest rates. Even among the legions who doubt that Fed officials will pick the ideal moment to start increasing rates for the first time since 2008, few question the Fed’s technical competence. The central bank has a long history. The engine is known to work. So it may come as a surprise to learn that the old engine is broken. When the Fed decides that it’s time to “lift off” — perhaps this week, but more likely later this year — it will be relying on a new system, assembled from spare parts, to make interest rates rise. This is a cute, but meaningless analogy. The old means of controlling rates are no longer available. But the “new means” have nothing to do with “spare parts.” It’s more like “hope and prayer” or “magical thinking.” The Fed intends to wave a magic wand, intone “Abracadabra, rates go up!” And banks will hypnotically follow the suggestion, in spite of the fact that they are still just as awash in cash as they were before the Fed’s command. There is a general agreement among economists and market analysts that the Fed’s plans make sense in theory. A team led by Simon Potter, a former academic who now heads the Fed’s market desk in New York, has been testing and fine-tuning the details by moving billions of dollars around the financial system. But markets have a long history of scrambling the best-laid plans. Actually, it’s not hard to imagine at all. Banks are in the business of renting out money for a recurring fee. Let’s think of it as the widget rental business. The Fed manufactures and supplies widgets. It has supplied so many widgets to the widget rental agencies- the banks, that the rental rate is near zero. Banks are clubbing each other to get to the top of the pile so that they can snag a few customers to pay a couple of pennies in monthly rent for a portion of their massive pile of widgets. I’ll make it even more concrete. I had to rent a car for 4 days a couple of weeks ago. GM, Ford, Chrysler, Toyota et. al. have stuffed so many cars into the rental car channel that I was able to rent a car at BWI Airport for the ridiculous price of $13 a day. That’s akin to what the Fed has done with money. But wait. The Fed isn’t proposing to reduce the supply of supply of widgets. It is saying that you will keep all of your widgets and we will pay you a subsidy on them. We call that subsidy IOER, Interest on Excess Reserves. Since we, the Fed, created these widgets and stuffed them into your warehouses, it’s only right that we pay you to store them. In fact, we will increase the subsidy rate and make believe that that will cause you to charge your customers more than you currently are to lend the widgets to them. Instead of paying you 10 cents per widget per year, we will pay you 35 cents per widget per year. You still have all your widgets, but now you’ll be getting an even bigger subsidy for storing them. You can still rent them out for whatever rate you can get. The Fed expecting the money rental companies to charge more rent when they get an increase in their subsidies would be like the automakers expecting the rental car companies to charge more when the manufacturers give them an increased subsidy for holding so much inventory. So you as the widget rental agent have just seen your cost of storing the widgets drop by 25 cents because the Fed is paying you more of a holding subsidy. You are still competing in an oversupplied market against other widget rental agencies. So what do you and they do when your costs are lowered? Do you raise your price as the Fed wants, or do you lower it so that you can maintain your market share at your now lower costs? You’re the rental agent, so I’ll let you decide. The Federal Reserve has held short-term interest rates near zero for almost seven years. Officials are now debating whether the economy is strong enough to start raising rates. When the Fed does move, the cost of borrowing and the return on savings are likely to start climbing too. That statement is an assumption. It is the assumption that the Fed wants the market to believe. It is the assumption that the Fed wants its captured media corps to drum into your consciousness. The theory is that if you repeat a propaganda lie often enough, the public will begin to believe it and it will become a self fulfilling prophecy. They could be right and I could be wrong. This is where I am most uncertain. We have seen these propaganda tricks work in the short run, and sometimes the short run can last a long time. We just don’t know how long it will take for the forces of reality to take over. The stakes are huge. The Fed is in charge of keeping economic growth on an even keel: minimal unemployment, moderate inflation. It tends to operate conservatively and to change very slowly because when it errs, the nation suffers. Yet the Fed has found itself forced to experiment. The immense stimulus campaign that it started in response to the 2008 financial crisis changed its relationship with the financial markets. It has pumped so many dollars into the system that it cannot easily drain enough money to discourage lending, its traditional approach. Instead, the Fed plans to throw more money at the problem, paying lenders not to make loans. That is correct. The new Fed policy amounts to increasing their government subsidy. It is simple bribery. They will attempt to bribe the banks not to make loans. But they can’t enforce that. The banks will still hold all the cash they did before. The increased subsidy will lower their cost basis. I fail to understand how bribing them by paying them more money and telling them not to lend would work. The Fed, embedded in the banking system, has also concluded that working through the banks is no longer sufficient to influence the broader economy. It plans to strengthen its hold by working directly with an expanded range of lenders. Fed officials have repeatedly expressed confidence that the plan will work. “The committee is confident that it has the tools it needs to raise short-term interest rates when it becomes appropriate to do so,” Janet L. Yellen, the Fed’s chairwoman, told Congress earlier this year, referring to its policy-making body, the Federal Open Market Committee. And if the new approach does not work at first, Mr. Potter said in a recent speech, then his team of monetary mechanics “stands ready to innovate” until it does. They are priming the market for the eventuality that rates won’t stay up, if they rise at all, for the reasons I have noted above. But the fact is that if I am correct, and the market refuses to cooperate with the Bribe A Bank Interest Rate Policy (BaBIRP), they then would have no option other than beginning to shrink the balance sheet by letting assets mature. Instead of rolling the paper over as it has been doing, the Fed would force the Treasury or the GSEs who issued the MBS and Agency paper which the Fed holds to repay the Fed at maturity. The repayment of the bonds would force the Treasury and the GSEs to enter the market to borrow that cash. The increase in their borrowing would force rates higher. The markets desk at the New York Fed has put monetary policy into practice since the mid-1930s. In the decades before the Great Recession, the desk exercised its remarkable influence over the American economy through its control of an odd little marketplace in which banks could come to borrow money for a single night. The Fed requires banks to set aside reserves in proportion to the deposits the banks accept from customers. The reserves can be kept in cash or held in an account at the Fed. Banks that need reserves at the end of a given day can borrow from banks that have a surplus. Before the crisis, the Fed controlled the interest rate on those loans by modulating the supply of reserves: It lowered interest rates by buying Treasury securities from banks and crediting their accounts, increasing the supply of reserves; it raised rates by selling Treasuries to banks and debiting their accounts. This is incomplete, but essentially accurate. Most reserve management in recent years was done through the use of Repurchase Agreements, or repos. These were essentially Fed overnight loans to the banks. It was the key to the Fed Funds market–the bank overnight lending market–and the Fed Funds rate. The Fed set a target Fed Funds rate, and then would issue or withdraw repos daily to keep rates within the target range. In order to do that, it kept the level of excess reserves to an absolute minimum. That gave the Fed a measure of control over the Fed Funds rate. As the crisis hit in 2008, the Fed pressed this machine to its limits. It bought enough securities and pumped enough reserves into the banking system to drive interest rates on short-term loans to nearly zero. The federal government now pays about a dime to borrow $1,000 for one month. Companies with good credit pay about a dollar to borrow $1,000 from money market funds and other investors. But the Fed didn’t stop there. It kept buying Treasuries and mortgage bonds to eliminate safe havens, forcing money into riskier investments that might generate economic activity. As a byproduct, the Fed kept expanding the supply of reserves. One result is a banking system almost comically awash in money. 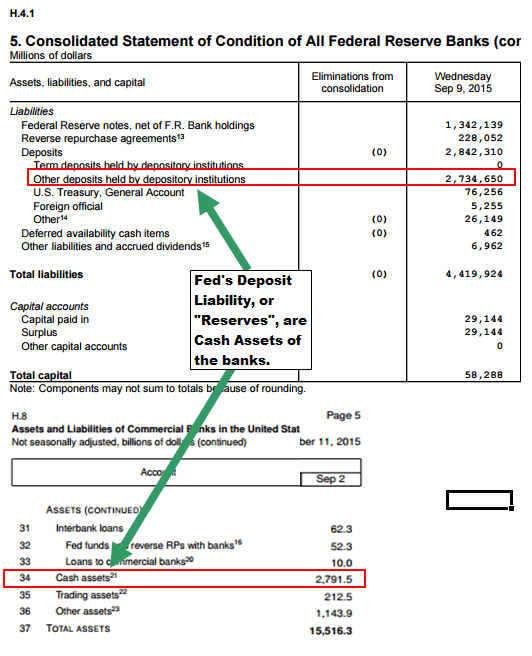 In June 2008, banks had about $10.1 billion in their Fed accounts. The total is now $2.6 trillion. Picture all of the money in June 2008 as a single brick; the Fed has added 256 bricks of the same size. On top of that first brick, there is now a stack five stories tall. Bank of America, for example, had $388 million in its Fed account at the end of June 2008. Seven years later, at the end of June 2015, it had $107 billion. The bank could double in size and double again and still have more reserves than it needs. The metaphor is again cute, and this is essentially accurate. I would just add that when you are in the brick rental business, and the market needs 2 bricks and there is only one brick, its value is whatever you, the brick owner, want it to be. When there are 256 bricks and the market needs 2 bricks, the other 254 bricks are worthless regardless of what the brickmaker says they are worth. To switch metaphors, the old monetary-policy machine sits at the bottom of a lake of excess reserves. The Fed would need to sell most of the securities it has accumulated before short-term rates would start to rise. Selling quickly could roil markets; selling slowly could allow the economy to overheat. So the Fed decided to find another way. This is the crux of the issue. It is the corner into which the Fed has painted itself. It has made the market dependent on ZIRP and QE, and now the Fed fears what may happen if it withdraws them. The answer is that nobody knows, because this hasn’t been done before under similar circumstances. What we do know is that the Fed and Wall Street fear the unknown. So they are averse to trying to do what is right and absolutely essential for restoring sanity in incentives for rational investment decisions , rather than the rank speculation and financial market distortion we have had for the past 7 years. Instead of draining all that excess money, the Fed decided to freeze it. For the last seven years, the Fed has encouraged financial risk-taking in the service of its campaign to increase employment and economic growth. By starting to raise interest rates, the Fed intends to gradually discourage risk-taking. The straightforward part of the plan is persuading banks not to make loans. In a serendipitous stroke, Congress passed a law shortly before the financial crisis that let the Fed pay interest on the reserves that banks kept at the Fed. Written as a sop to the banking industry, it has become the new linchpin of monetary policy. The Fed will “pay banks not to lend.” This is the essence of why it is akin to bribery. More than seven years ago the Federal Reserve put its benchmark interest rate close to zero, as a way to bolster the economy. But that policy is about to change. Say the Fed wanted to raise short-term interest rates to 1 percent, meaning that it did not want banks to lend at lower rates. Because the glut of reserves is so great, the Fed could not easily raise rates by reducing the availability of money. Instead, the Fed plans to pre-empt the market, paying banks 1 percent interest on reserves in their Fed accounts, so banks have little reason to lend at lower rates. “Why would you lend to anyone else when you can lend to the Fed?” Kevin Logan, chief United States economist at HSBC, asked rhetorically. “Why would they not?” I would ask Kevin. They still have all of the funds. The Fed increasing the rate on reserves would not restrict the banks from lending money in any way. The reserve exists as a liability account at the Fed. But it is still a cash asset to the banking system as a whole. The banks could make trillions in loans at whatever rate they want to without running into any constraints whatsoever as long as those excess reserves exist. If the Fed increases their subsidy, they could lend at an even lower rate and still be just as profitable as before. In fact, if the Fed wants to raise rates, it would need to charge the banks interest on those reserves, not pay interest. In charging the banks interest, it would increase their cost of funds, forcing them to raise rates. This is exactly the opposite of what the Fed is proposing. This is not a cheap trick. Since the crisis, the Fed has paid banks a token annual rate of 0.25 percent on reserves. Last year alone, that cost $6.7 billion that the Fed would have otherwise handed over to the Treasury. Paying 1 percent interest would cost four times as much. The Fed has sent roughly $500 billion to the Treasury since 2008. As the Fed raises rates, some projections show that it may not transfer a single dollar in some years. Instead, the Fed will pay banks tens of billions of dollars not to use the trillions it paid them previously. And, as I have so often complained, this comes straight out of taxpayers’ pockets. I dare say that it won’t go over well when taxpayers figure out that they are paying an even larger subsidy to keep banks profits high. That is, if anybody in Big Media bothers to inform them. Applebaum’s mention of this in passing buried in the bowels of his piece is one of the very few times I have seen even a slight allusion to this issue by Big Media. At first, Fed officials thought that paying interest to banks would establish a minimum rate for all short-term loans, exerting the same kind of broad influence as the old system. It soon became clear, however, that rates on most such loans remained lower than 0.25 percent. Even banks that needed overnight loans found they could borrow more cheaply. The average rate in July was 0.13 percent — about half of the Fed’s new benchmark rate. The rest of the financial system is also awash in cash, and lenders — like money market mutual funds — put downward pressure on interest rates as they fight to attract borrowers. Here he comes closer to getting to the crux of the problem, but then he goes back on message. And here’s where the Fed’s plans got a little less orthodox. The Fed lacks the legal authority to pay these lenders a minimum interest rate on deposits, as it does to the banks. But two years ago, Lorie Logan, one of Mr. Potter’s top aides, suggested the Fed could achieve the same goal by borrowing from these companies at a minimum interest rate. The resulting deals, known as overnight reverse repurchase agreements, signal a significant break from the Fed’s history of working through only the banking industry. Overnight RRPs are just another line item on the Liability side of the Fed’s balance sheet. It’s still overnight money, a cash asset to the account owners. It changes nothing in the big picture. The money market funds and others who own the Fed paper could hypothecate it for whatever rate they wanted, or convert it back to a bank deposit to be spent on whatever the next day. It would not change the level of excess reserves one iota. It would not influence the banks to raise rates. When liftoff arrives, however, the Fed plans to place this machinery inside the familiar language of the old system. It is likely to announce that it is raising the federal funds rate, the interest rate that banks pay to borrow reserves, from its current range of 0 to 0.25 percent to a new range of 0.25 to 0.5 percent. The Fed does not plan to emphasize that this rate is now a stage prop or that the real work of raising rates will be done outside the limelight by its new tools. Has Mr. Applebaum shown his true colors? The appellation of the Fed Funds rate as a “stage prop,” pretty much nails it. On weekdays at about 12:45 p.m., the New York Fed’s trading portal, known as FedTrade, plays three musical notes — F-E-D — signaling that Mr. Potter’s shop is open for business. So begins another day of training camp, another test of the Fed’s plans to borrow money from nonbank financial companies. The Fed’s traders sit at terminals in a converted conference room. Along one wall are five chairs and five sets of computer monitors beneath five historical photographs of the trading desk: men answering phones, men writing bids in chalk on a long board and, in the most recent photograph, from the 1980s, a glimpse of a woman in the background. On another wall is a screen that links the room in New York by videoconference with a backup trading room at the Chicago Fed. Potential lenders — a preapproved group of 168, including a bevy of money market funds and the housing finance companies Fannie Mae and Freddie Mac — have 30 minutes to offer the Fed up to $30 billion each. At 1:13 p.m., a warning message starts blinking red. At 1:15 p.m., the Fed closes the auction and accepts up to $300 billion in loans at an interest rate of 0.05 percent. During two years of experiments, the Fed team has adjusted the rates it pays, the amounts it accepts and the time it enters the market, among other variables. Mr. Potter and his lieutenants have also held lunch meetings with investors on the other side of the portal to solicit advice and complaints. The size of the program poses the most obvious risk. Fed officials limited daily borrowing to $300 billion because they didn’t want to freeze more money than necessary. They also worry about exacerbating market downturns by giving investors a new place to flee. These concerns were heightened by reports that some investment companies were interested in creating money market funds that would be advertised as the safest place to park money — because the money would be parked at the Fed. Last year, at the end of September, shortly after the cap was imposed, lenders offered the Fed $407 billion on a single day. Demand was so high that instead of asking for interest, some lenders offered to pay the Fed to take the money. The Fed ended up borrowing at zero percent and turning away $107 billion in loans. This is good evidence that the Fed can’t control rates via the RRP route. After a dozen or so tangential paragraphs the Times gets back to the issue at hand. Mr. Potter has worked at the New York Fed since the late 1990s, but he spent most of his career there in the research department before taking over the markets desk in 2012. He became more involved in the practical side of the Fed’s work during the financial crisis. In a 2012 speech at New York University, Mr. Potter said the experience — particularly during a four-week period at the peak of the crisis — had impressed upon him the limits of theory, the need to understand what investors are thinking and the value of flexibility in policy making. “For economists who did not have the opportunity to observe the panic up close as I and most of my colleagues had, the developments in this four-week period must have been bewildering, given how widely events on the ground and theory diverged,” he said. One of my guiding principles is the famous quote of Professor Lawrence Berra of New York’s Yankee University. “In theory there’s no difference between theory and practice. In practice there is.” It is my belief that the Fed’s new BaBIRP Theory of raising interest rates will fail miserably in practice. If and when the Fed ever gets serious about raising rates, it will need to shed assets from its balance sheet, thereby shrinking the excess cash in the banks, to do so. However, the relevant question may be whether the time that the Fed gets serious has arrived, or will ever arrive. That perspective may come in handy. The last time the Fed shifted the basic mechanics of monetary policy was in the early 1980s, when Paul Volcker was its chairman. That campaign is remembered as a triumph of central banking. Mr. Volcker succeeded in driving inflation down toward modern levels, ending a long period in which governments had floundered helplessly to prevent rising prices. But Mr. Faust, the Johns Hopkins economist, says the messiness of Mr. Volcker’s triumph is often overlooked. The Fed’s initial plans did not work and were revised and did not work and were revised again — and still didn’t work. He said the Volcker episode was a reminder that monetary policy is not figure skating. The Fed is likely to flail, he says, but it will be measured by its success in getting interest rates to rise, not by the grace of its performance. Central banks can raise interest rates when reserves are tight and they can exert control over the level of reserves in the system. The idea that they can control rates when there are $2.6 trillion in excess reserves is theory, unproven, and likely to be unsupportable in practice. If a bank lent $1, wouldn’t its excess reserves decrease by $1, and wouldn’t the bank then lose whatever interest the Fed paid on $1 of excess reserves? TBoemker Here’s how I understand it. Banks create loans by crediting the borrower’s account with money that did not exist before the loan transaction. It would not impact the bank’s deposits at the Fed. Loans create deposits. The lowering of costs would normally be an incentive to banks to make more loans. Their spread will increase. Required reserves are 10% of checking deposits. With sweep accounts where balances are swept into time deposits nightly, required reserves are effectively zero. With so much excess reserves in the system, for practical purposes this would never be a constraint. Lee_Adler Thank you for explaining that.